Docebo allows you to deploy online and blended training all over the world, which is why we have implemented the Timezone feature, which is an option that allows you to manage different time zones on your platform. For example, if your company is based only in one country, then your platform will be set to a unique time zone, while if you have headquarters in many countries with different time zones, you can actually let your users decide their own time zone. In this manual you will learn how to set and manage the Timezone option. 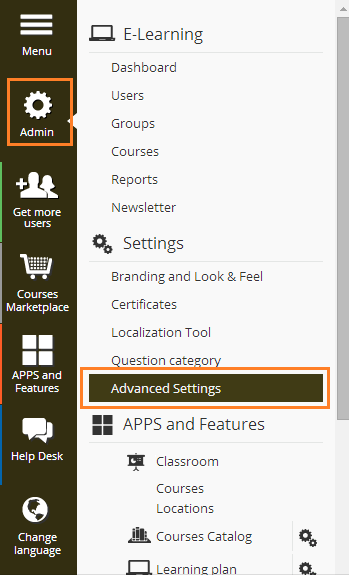 ‘Timezone’ is a new feature located in the Advanced Settings area; to access it, select the Admin icon from the sidebar and choose Advanced Settings. From the Main Functions side menu select the Date & Time tab. 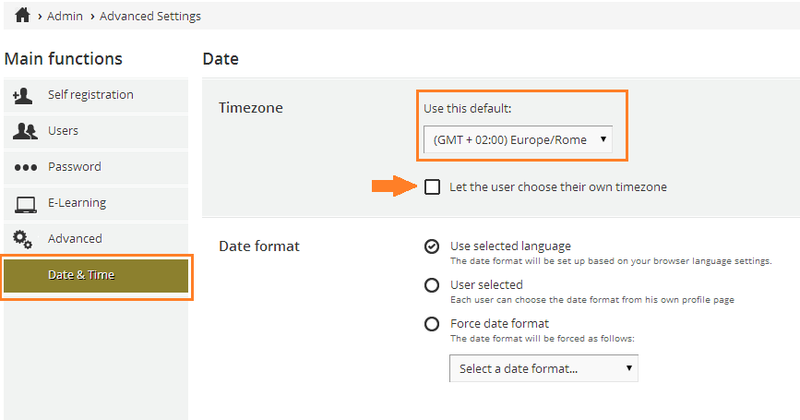 This is where you can decide the default time zone by selecting it from the dropdown menu, or flagging the ‘Let the users choose their own timezone’ option. Use selected language: the date format will be set up according to the browser language of each user. User selected: each user can choose the format from their profile page. 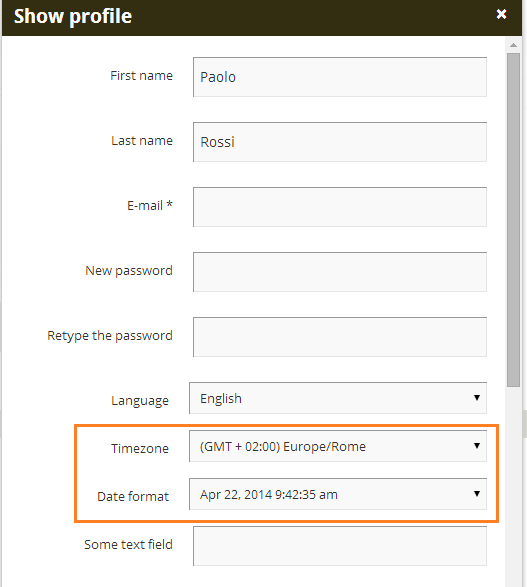 Force date format: you, as superadmin, can impose a date format from the dropdown menu. Click ‘Save Changes’ to confirm the chosen options. In the Advanced Settings area, select Users from the side menu, and be sure that the In user profile, enable the change password option only checkbox is not selected, because otherwise, even if you allow users to choose their own time zones and date format, they will not be able to see these options. Where can the user set their preferred time zone? This section will show how users can see and manage their date and time options if you decide to give them control over these choices and you have already enabled them to see and edit their profile. Log in using a user profile. 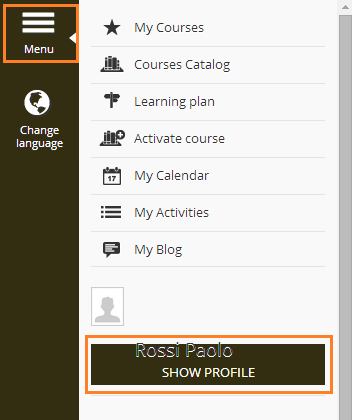 Select the Menu icon from the sidebar and choose the ‘Show Profile’ option – as you can see in the picture below. You will then be redirected to the user profile. 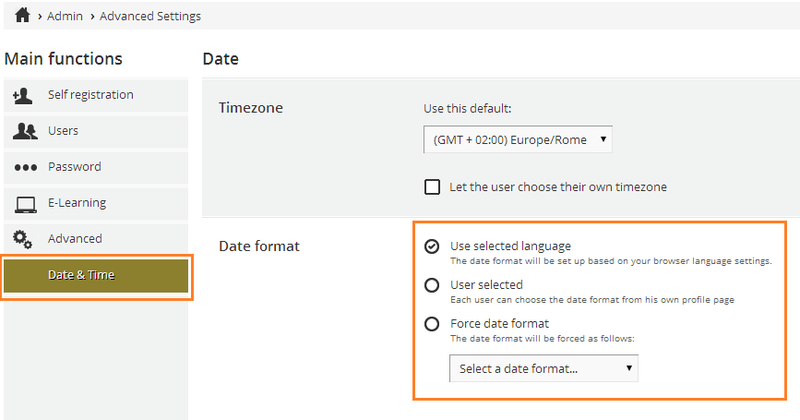 Within the available options, there are the ‘Timezone’ and Date format options; here, choose your own preference from the dropdown menu. To confirm your choices select ‘Save Changes’.